. . . Mary Green ponders the many meanings of the word “green”. The end of 2013 and the start of this year were mild, so the countryside stayed green. Indeed, golden-brown leaves were still there on the oaks until well into December, and odd flowers are still about on campion, white deadnettle, daisy and hogweed. Snowdrops’ leaves were showing by new year, and I have already picked young leaves of Cornish garlic and cow parsley for my salad. On Alvechurch station platform bank, there were red and white dead-nettles aplenty, and even a lone moon daisy – more flowers than in July! I have been pleased to see a new resident on our stretch of canal at Withybed this winter. For several autumns, as I recorded in The Village a couple of years ago, I have seen a barnacle goose among the Canada geese. It never stayed long. However, this year it appeared in November and stayed, looking as if it has paired up with one of the Canadas. I don’t know if it always stays for the winter and it’s just that the Canadas it hangs about with are usually elsewhere on the canal or reservoirs, and have now decided to spend Christmas with me, or whether it has stayed in the area for the first time. The reason it’s noteworthy is that it’s completely out of its normal geography. Barnacle geese migrate from colder countries to Scotland for the winter, but don’t normally come this far south or inland. They arrive so suddenly and mysteriously on the Scottish coast that people used to believe they hatched out of barnacles – shellfish – hence the name. They look like smaller versions of Canada geese with black where there should be white. I wonder how many of you have seen it and not been sure what it is. There has been an even rarer bird visitor to Alvechurch over the Christmas period. You may have seen people with large camera lenses and binoculars peering over the hedge nearby. They were looking at a great grey shrike. This is now a rare winter visitor, once common in Britain, with a few each year usually near the east coast. It is around blackbird size, distinctively black, grey and white. It hovers and catches prey, from insects to small mammals and birds, and perches on treetops. It has an odd habit of hanging excess catches on thorns and bushes as a sort of larder! It used to have a reputation as a very rapacious hunter in the days when it was a British breeding bird. After all that rare black and white plumage, my theme this month is to look at a word we use all the time about the ordinary countryside – green. It used to be a simple word associated with growth and youth, and the living world. Now it has political and philosophical meanings too. In its literal sense, green is truly the colour of plant life. It comes from chlorophyll, essential to growth. Most plants have green leaves – at least until autumn when the chlorophyll is drawn back into the plant and other colours appear. Green and flowering plants are crucial to the survival of the planet as we know it, the basis of all life. No wonder we have a strong positive feeling about it. In winter it may almost disappear as the grass goes brown and leaves disappear, and green is at a premium for both food and spiritual well-being. Hence a lot of our winter celebrations involve bringing greenery indoors, and we talk about “eating your greens” as a way of keeping healthy. Even our desire to keep mowing lawns to almost nothing is partly our wish to keep them green, instead of the natural brown of winter grass. It seems odd that green is not one of the primary colours, but a mixture of blue and yellow. That may be so in terms of light and pigments, but in our culture green is a very basic colour. The last flowers to bloom in autumn are green, on ivy. Our two native hellebores are green-flowered and come early: I saw some in flower in January this year. Overwintering flowers include the ubiquitous white dead nettle, daisy and some of the parsley family, all white and green. And of course there are hundreds of grasses, reeds and sedges, all mostly green-flowered. Colours somehow come as an afterthought – really because they are there to attract insects. If you look around you in February, most of the signs of coming spring are green. You will see the leaves of hedge parsley everywhere, now in their edible stage. You’ll also find other edible leaves: dandelion, garlic mustard, bittercress, golden saxifrage, even wild garlic. The first green leaves may appear on the hawthorn this month, known as bread-and-cheese in past times because they were a basic food. And, of course if you go to the even older plants, the non-flowering ones, they are really green – ferns, bracken, mosses and lichens. This winter the ferns and bracken have stayed green through the winter into January. Abundant mosses and lichens are a good guide to unpolluted air. Green came to be a nostalgic colour as our world became more industrialised. The green, green grass of home existed long before Tom Jones! But up to the 18th century the green countryside was not thought of as the ideal. Our word “civilisation” comes from the same Latin word as “city”, and people generally considered that the more we built and polished the world, the better. Nature was something to be dominated and exploited, and certainly not the landscape to visit on a journey. Then, as the effect of the industrial revolution began to be felt, the romantic movement suggested that the best features of human life were found among wild nature after all. Mountains and lakes became popular for tourists, and cities were seen as dark and satanic. We still have this romantic yearning for the countryside, expressed very strongly in the growth of “garden suburbs” in the19th and early 20th century, where town workers could feel as if they lived in the countryside. In the 20th century we had “garden cities” and the creation of the “green belt.” The cottage in the country is seen as an ideal, whereas it used to be a poor habitation best escaped for the more civilised pleasures of town. This view reawakened an old reverence for the spirit of nature often expressed in the ancient figure of the Green Man, also known as Jack-in-the-green or Robin Goodfellow. 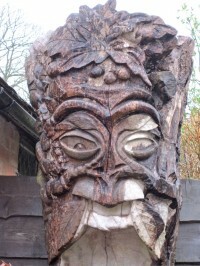 He was the embodiment of life and growth, dating back to pagan times but still figuring in pub names and flower names, and even on carvings in churches – and a wonderful carving down Birches Lane in Withybed! Ordinary country people clung on to this symbol during the “civilising” period when modern farming and the growth of towns were turning their backs on him. In its ecological sense, we now recognise that “green” is shorthand for the health of our planet and its ecosystems. It is used to mean biodiversity – the complex of life forms needed for sustainable life. We talk of green energy and green politics. There is a growing understanding of the interdependence of all natural life, including us, based on the greenness of plant life. We want to replace fossil fuels with renewable energy, because fossil fuels deplete the resources of the earth. We want to make sure humanity will survive by a better understanding of our environment. Planners now talk of the “green infrastructure” – the environment in which we live and on which we build our human infrastructure. But the word can be misleading. Many so called “green spaces” are green in colour but not much else. Mown grass has very little biodiversity. The “modern” garden of a few decades ago, with decking, patios, mown grass and sculptural non-flowering plants, was pretty useless for true “greenness”. One of the reasons bees and birds have declined is the lack of truly green spaces, replaced by those green in name only. However, a garden with native flowers, and trees or shrubs not cut down before their time, is a good wildlife habitat, better than much open country. The most disturbing aspect of this is arable farming. There are ecologists who say our whole history of agriculture has been on a wrong track, based as it is on monocultures of annual plants coupled with artificial fertilisers and weedkillers. We have small areas of this kind of “green” landscape round here, but areas like East Anglia have a lot. They have very poor biodiversity. A living environment needs perennial plants and trees as a basis, and exhausting the soil and killing “pests” means destroying this environment. The misunderstanding of “green” is noticeable in the way we talk about our “green belt.” Green belt land is a political and social concept, nothing really to do with ecology. It is essentially a negative concept as a counterweight to towns and cities, more about what the land shouldn’t be used for than what it should. It was established in the mid-20th century to stop cities and towns spreading and growing into each other. So, we have dense conurbations, with empty spaces between them which mustn’t be built on. We accept this as good because we now believe the countryside is naturally good and towns necessary but bad. But there are parts of the world where people are actively encouraged to develop houses in rural areas in order to keep them thriving. And the areas of Britain with most countryside aren’t green belt – only those near big cities are. Green belt isn’t even green, really. It doesn’t have to be either environmentally sustainable or economically sustainable, just not to be built on. 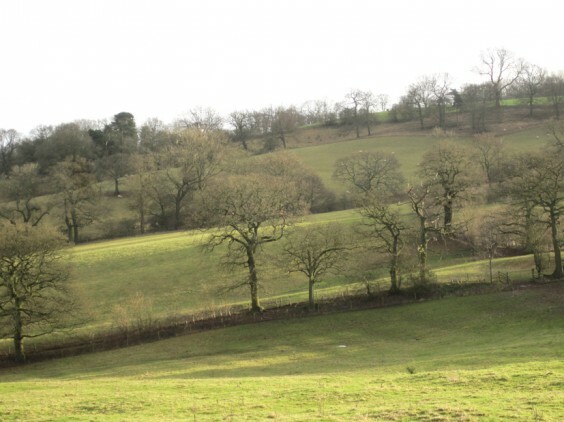 Fortunately round here most of it is environmentally green – traditional pastoral farming, old woods and hedges typical of the landscape characteristic of this area, good for biodiversity. Some of it is successfully farmed or used for leisure, and therefore economically sustainable. But there are areas in the green belt that are environmentally poor. We can see something similar when we look at areas of outstanding natural beauty, national parks and other protected sites. Some of these are truly green, the haven for our diverse traditional wildlife and protected species. Some of them, such as many of our heaths and moorlands, are very poor in soil quality and biodiversity although they may have a few rare species. Many of the forests planted in the 20th century lack biodiversity, being non-native conifers. In some places, including our own Newbourne Wood, these are now being removed and replaced by native trees. So, just because it has trees or grass, or is labelled green space or green belt, it may not really be “green” in the full sense of the word as we use it now. Anyway, perhaps we should really call environmental movements “brown” rather than green, as it is the quality of the soil and all its complex components that make plants and therefore all life sustainable. What it comes down to is that the opposing myths of cities being the heart of civilisation, and of nature being wild and free and good, are both just that – myths. Really we can make the world as “green” as we choose to, by keeping a balance between human habitation, food and energy needs, and the necessary sustainable natural world around us. Most of the best habitat round here is of human making: our canals and reservoirs, our hedges, verges and meadows. When we lose a lovely old hedge like the one that’s just gone from the station area, it takes decades to replace the habitat. It’s something to think about as we enjoy the coming of green plants and the approaching spring. I hope we don’t get winter weather coming late, and that it’s not white instead of green by the time you read this! Spike through the brown leaves, and here is a daisy. All winter long, and the field grass emerald. In the sun and rain as the year opens out. Frost and snow steal in, whiten the green. I want to wrap them all in a warm fleece. Till the worms and the bees go, and no birds sing. Because the green will come back, when we are gone.